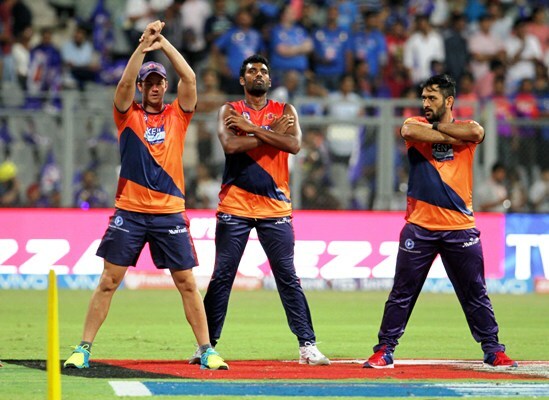 IMAGE: Rising Pune Supergiants players warm up. Photograph: BCCI. Rising Pune Supergiants all-rounder Rajat Bhatia has said no side can do much if the players get injured but it gives chance to other players to showcase their talent. "Injuries are unavoidable. We can only do our best. It's a big squad and everybody gets opportunity. Let's hope for the best," he said. They are placed a lowly sixth on the points table andt injury-struck Bhatia says it's still early to write off his team as he believes the replacement players will lend much-needed stability to the side. Grappling with injuries to key players such as Faf Du Plessis, Kevin Pietersen, Mitchell Marsh and Steve Smith, the Mahendra Singh Dhoni-led side has managed to win only two of its eight games so far. "We now have Usman Khawaja and George Bailey in the side, coming in as replacements. Hope it (combination) works now." Asked if the team's strategy would be moulded according to the new players coming in, Bhatia said it won't make much of a difference. "There is no strategy. When you win people say, the strategy has worked. But it is about momentum." IMAGE: Rajat Bhatia of Pune Supergiants during practice. Photograph: BCCI. As Pune gear up to take on hosts Delhi Daredevils, Bhatia said, they have "nothing to lose" in Thursday's game. "You never know. Some teams who are winning might lose and teams that are losing may win. You can't judge any team at this stage of the tournament. In T20 cricket, it can change any time. It's all about momentum," Bhatia said. Bhatia also said that skipper MS Dhoni was still keeping a cool demeanour and that is remarkable. "Nobody knows what is going on in his mind. His thinking is completely different. He is unbelievable. Even when you are expecting that he will be angry, he does not get angry. That's what I am learning from him. How to stay calm." Will Rising Pune Supergiants's bowling deliver against Daredevils?